This featherlike Fissidens-moss with tight deep green down comes from North America. It grows relatively slow and requires much more light than other mosses. Suitable for binding roots and stones both vertically and horizontally in the aquarium. As we continue to make it our priority to bring the highest quality products to the freshwater aquarium industry, we’re thrilled to announce we’ll be bringing Tropica tissue cultured plants to Aquatropic! With proper care, planted aquariums are some of the most stunning and natural of aquatic displays, but, as with any delicate ecosystem, it’s vital to carefully select where you source your livestock. 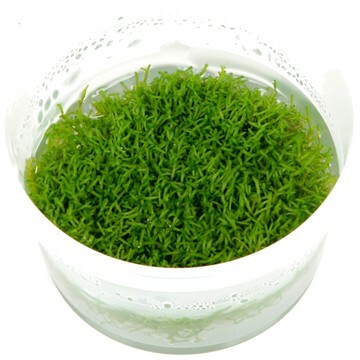 Providing some of the most beautiful and healthy aquatic plant life, Tropica’s dedication to uncompromising quality has made them a leader in the European market and a product we’re extremely pleased to be able to offer our customers. 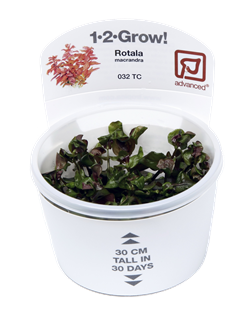 The “1-2-Grow!” line offers a wide variety of young, 100% tissue cultured plants, cultivated directly in Tropica’s state-of-the-art laboratory and packaged compactly in individual cups. This sterile method of micropropagation ensures all plants are completely free of pesticides, snails and algae that may potentially harm other inhabitants. Aquarists divide the tiny plants and then propagate them as desired within their aquarium, allowing for the unique experience of watching their aquatic garden grow into a lush display. Each cup is clearly labeled with corresponding symbols—“easy”, “medium” or “advanced”—to help consumers select plants that best fit their aquarium, and Tropica’s informative and interactive website provides guidelines to each plant’s specific needs and care requirements. Showcasing over forty species of mosses, ferns, liverworts and flowering plants from around the world (including many rarities not commonly seen within the trade), the “1-2-Grow!” line of tissue cultured plants has something for everyone. Useful for softening aesthetics and creating verdant displays, mosses grow over hard surfaces like rocks and driftwood. Aquatropic will be carrying several popular varieties to meet a wide range of aquascaping needs. 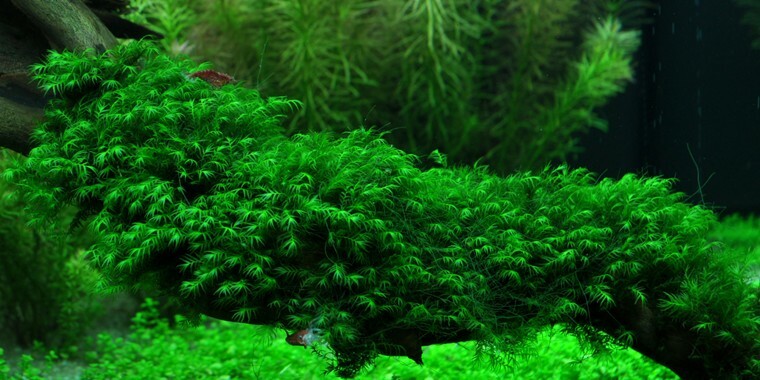 From taller species like Flame Moss (Taxyphillum) to the leafy fronds of Christmas Moss (Vesicularia), these undemanding plants offer many unique looks and are perfect for low-light aquariums and those new to aquatic plants. Typically, shorter plants are placed in the foreground of an aquarium, and most are capable of spreading out across the bottom to form a dense carpet of vegetation resembling lush, rolling hills. The “1-2-Grow!” line includes many plants to choose from here, from beginner species like Staurogyne repens to the challenging Dwarf Baby Tears (Hemianthus callitrichoides), and even the unusual clover-like fern Marsilea crenata. Vertical stem plants are best placed towards the middle and rear of a display where they’ll stand out against the shorter foreground, adding an element of forest-like density and depth. Bushy species like Hygrophila and Pogostemon erectus add visual interest as midground plants, while taller species such as Potamogeton gayi and Rotala rotundifolia fare well as background subjects. We will also be offering many vibrant species possessing red leaves—Alternanthera reineckii, Ludwigia palustris, Rotala macrandra, Rotala wallichii—perfect for adding some colorful contrast to an aquascape. Great for ponds and open displays, floating plants typically have long, decorative roots, with leaves that sit above the water surface. The roots not only add visual interest, but can serve as good hiding places for many species of fish. Available in the “1-2-Grow!” lineup are Azolla filiculoides, whose leaves grow in dense geometric clusters, the larger leaved Limnobium laevigatum and the tiny fern Salvinia natans, whose leaves grow side by side in long chains. There’s much more plant life to discover, such as the peculiar moss Riccia fluitans, a versatile species that can either be attached directly to the hardscape or allowed to float freely as a dense mat. And there’s also the unusual liverwort Monoselenium tenerum, known as Pelia—an undemanding plant that can form beautiful bushy formations. Aquatropic carries a growing variety of high quality freshwater fishes and invertebrates, plants, dry goods and equipment. We are proud to be the freshwater sister company of Quality Marine, a respected leader in the aquarium industry for over 35 years, providing only the best, sustainably sourced marinelife. My company operates in the field of sale(PET SHOP) Accessories For Fish, birds and ornamental plants for more than 20 years. We import most of the supplies and accessories from Europe and China and through some agents in Saudi Arabia. We have three branches in the city of Taif all of which shows an area of not less than 300 square meters per branch. For the first order usually at least one container 40 feet.